'Tis the season to be jolly and we're spreading the joy with our own take on the 12 Days of Christmas. Each day we will feature a different aspect of home automation and integrating all the devices in a home which turn it into a smart home. On the 9th day of a Smart Home Christmas, we bring 9 motorized blinds and curtains. Motorized blinds, curtains, and shades provide convenient, reliable control of window coverings. They eliminate the need to pull a string or twist a rod. No more battling with multiple strings, getting them tangled up, or ending up with one side of your blinds being lower than the other. In homes with tall ceilings and two-story rooms, motorized coverings are particularly helpful as they relive you of having to reach up or grab a ladder to make adjusts. 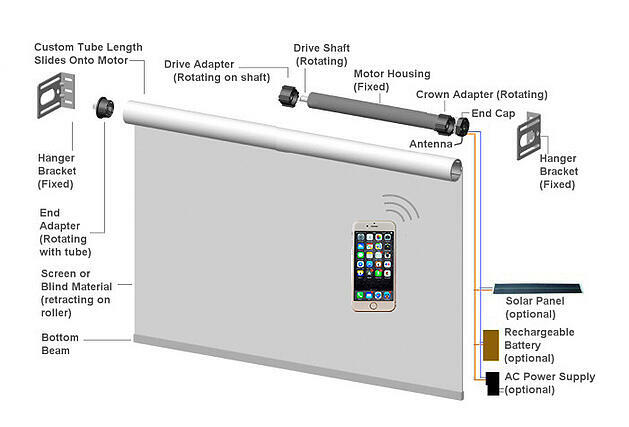 Motorized window coverings are programmable. They can be configured for one or more positions and multiple coverings can grouped together so that all coverings in the group are perfectly aligned to the same position with a single command. Once programmed the homeowner can simply press a button on a remote or in a smartphone application to adjust their motorized shades to the desired position. Light sensors, available with many models, are a nice addition too. When the light shining through your windows reaches a defined level, they trigger your motorized coverings to automatically adjust. This is great for dealing with early morning or late afternoon conditions when the sun is low and shining directly through your windows. These motorized marvels aren't just about looks. They make a smart home even more powerful when connected to a home automation system. Doing so enables the motorized blinds, shades, and curtains to be added to existing scenes and programming in your system. For example, they could be added to the home and away programs. Then when you leave or return to the house and arm the home security system, the window coverings will be closed and opened automatically. This makes a home less attractive to criminals and increases the security of the home while you are away. No more having to worry about leaving the shades open or having to open them all up when you return! The versatile controls and benefits motorized window coverings provide is why they are the 9th way we're introducing to you to make a home smart. Let's look at the basics. Motorized window coverings require a motor, a rotating shaft, mounts, a battery or AC power, and a receiver to accept the commands from remote or smartphone. There are wired and wireless options. Wired solutions require you to connect the blinds to a home automation system or hardwired controls mounted on a nearby wall. Wireless versions can be controlled by infrared (like your television remote) or radio frequency (RF) remotes, through a smartphone app, or compatible home automation systems. When you press the button on a remote or in your smartphone application, the receiver processes the requested action and triggers the motors to perform the necessary adjustments. For those with window coverings connected to their smart home system, there is also the option of tying programming to scenes on a keypad. This is great for home theater and party scenes. With the press of a single button all your blinds coordinate their action with lighting, and whole-home audio to create an ambiance that's sure to amaze guests. There are so many reasons motorized blinds, shades, and curtains matter to you that we're going to break each one out. We promise you this on is bigger than it sounds. You'll save time by controlling your window treatments with the press of a single button, eliminate the hassle of reaching for chords and rods on windows located up high, and all the coverings align themselves perfectly every time. All without the need to get up from that oh so comfortable couch. Say goodbye to blinding sunlight hitting you in the face and hello to convenience. Many thefts are crimes of opportunity. Thieves are looking for valuable items they can quickly grab. One of the best ways to deter them from your home is by making it difficult for criminals to see into it. Motorized treatments make it easy to close all of them with one button press. Adding them into a home automation system makes it possible to schedule adjustments to your window coverings. This simulates presence while you are away. No one will be able to tell that it's a system controlling them and not you. To potential intruders it'll look like you are home even when you are not. We all love sunlight shining into our homes. But, when the sun shines into rooms for long periods it really heats them up and costs us a lot of money to cool them back down. Adding light sensors to motorized blinds and shades enables them to adjust to changing light conditions, balancing light levels with energy efficiency. Connected to a home automation system, thermostats and temperature sensors can also be used to trigger adjustments in motorized window treatments. Your house will stay cool and use less energy to keep it comfortable. Window coverings not only block out sunlight, they also provide privacy. The recent trend of building larger homes on the same sized lots as the past means your neighbors are much closer. Motorizing all the coverings in a room makes it easy to press a single button to give you privacy before you slip into the bathtub, are getting ready for bed, or in the morning while you are roaming around in your bathrobe. We all know that UV rays are damaging to our skin. They also damage the possessions in our home causing them to fade or become dried out and brittle. Having the shades in your home adjust automatically in rooms with a lot of sun will protect your furniture, carpets, and art. Smart homes and home automation are becoming increasingly popular. This is because features that improve a home's energy efficient and increase functionality are desirable. Motorized window treatments provide both, making your home more attractive and thus valuable when you sell it. Check out our pages dedicated to home video surveillance systems and smart home automation, or contact us to learn more.